This past week, I have spent quite a bit of time working on a simulator for a two-wheel differential drive robot. The idea was to use simulated encoder and range finder data and an Extended Kalman filter to determine the location of a robot. My implementation is written in Python and hosted here. The system is modeled as having two inputs - The left and right wheel speeds. The robot is externally given control inputs, but they are unknown to the Kalman filter. The only inputs to the Kalman filter system are the encoder values and the range finder values and a set of known landmarks (this is to simulate mapping or some other landmark detection). The encoder inputs are Vl and Vr. From these values, we can surmise the average velocity V, and the rotational velocity w of the robot. We can then use the image below to determine the simple version of the equations of motion of the robot. An image of a differential drive robot. The update step (a posteriori) is a bit more complicated. 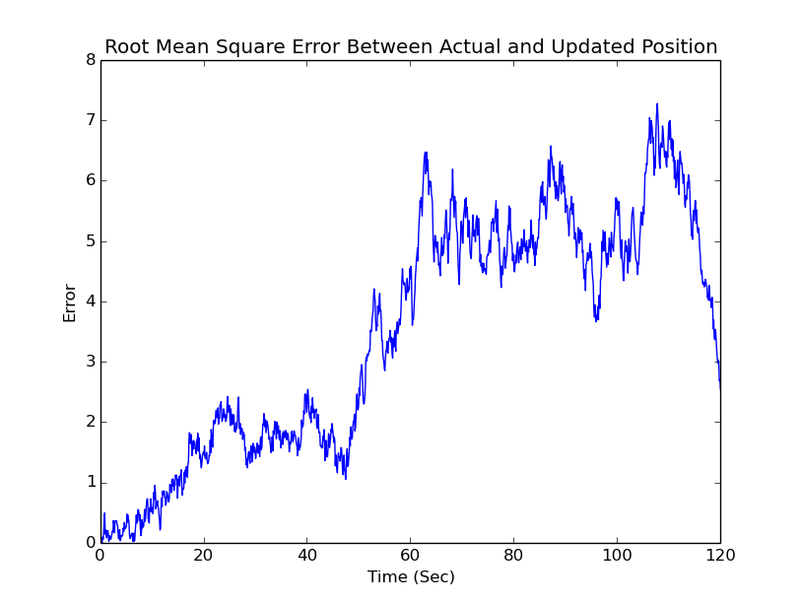 The idea is to use a separate sensor (or multiple) to improve the quality of the prediction. In this case, we will use a range finder to find landmarks and use those landmarks to determine where we should be and correct the position. Of course, the range finder is not a perfect sensor and has Gaussian noise too. This will be included in our calculations. There are 4 parts of the update step. The first is to calculate the difference in the measured values (from the range finder) and the predicted values from the previous step. The h matrix, or measurement matrix, puts the states from the last step into the same space as the measurement values. Then, we also need to calculate the Kalman gain. This gain is a matrix that tells us how much we want to use the new measurement to update the prediction. It is calculated using the sensor covariance matrix, the estimate covariance matrix and the Jacobian of the h matrix, H. Using the residual and the Kalman Gain, we update the state prediction. Finally, we updated the covariance matrix, using the Kalman Gain and H matrix. The actual formulas are laid out below. In order to make the landmark detection work, the x and y positions of the landmarks were augmented to the states matrix. X. By adding those values, the Kalman Filter became an EKF and many other matrices had to be changed, as well. The reason for doing this, is to keep track of the landmarks and allow them to make changes to the prediction, only if they are seen. In my case, they are always seen, but in an real-world scenario, the range finder might not be able to see all of the landmarks or misses them. Here are some results of my work. A typical run can be seen below. 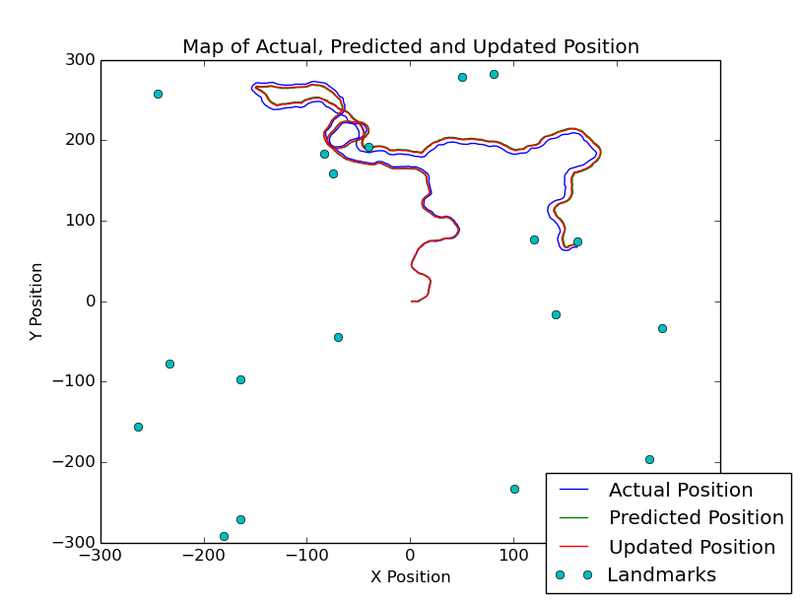 In this image, the actual position of the robot is in blue, the initial prediction is in green and the final prediction (after landmark detection with 20 landmarks) is in red. The robot tracks the random path very well over 2 minutes, with a time step of 0.1 seconds. The error between the actual and updated paths for this run can be seen below. There was an average RMS error of 3.45 units over the course of the path. What is neat, is that the Kalman Filter seems to correct itself when there is a lot of error. If odometry was the only sensor used, the error would grow much faster, and it would not correct itself. Currently, I am working with the new PulsedLight Lidar-Lite range sensor, a small Laser emitter/receiver that can measure distance in one direction. It is a terrific sensor that I bought for only $89 on-line. A typical Lidar sensor is usually in the hundreds or even thousands of dollars, so this is quite a bargain, and something that the at-home maker can afford. Not only is it cheap, it als has terrific accuracy and works with both PWM and I2C. As of right now, I am writing a couple of libraries in Python and C++ to interface with the Lidar-Lite via I2C. My work is currently posted here. Most of my experimentation has been using a Raspberry Pi with Rasbian Wheezy. The idea is to make these libraries portable and then use them on a Robot Operating System (ROS) project, down the road. Once the library is finished, I will post a quick tutorial on how to use it. PusledLight also has a great repository of Arduino sketches for use the Lidar-Lite here. I have tried them out and they work great. Check it out!